Garden Grove Electrical Diagnosis and Repair - Morrison Tire Inc. Your battery is integral to starting your vehicle. It also stores energy created by your alternator and provides power for electrical systems such as your radio, lights, powered windows and mirrors, and other electrical components. Morrison Tire stocks batteries for more than 90% of vehicles on the road today and has access to the other few in no time. Our current inventory includes AC Delco batteries and other brands like Interstate and Motorcraft are just a phone call away. Come in today and let us check your battery performance. Need one replaced? Look to Morrison Tire for a quick battery replacement! Having a bigger problem with your vehicle? Not sure exactly what is going on? Morrison Tire is here to help! Our ASE experts can test your starting and charging system to pinpoint exactly what is wrong. 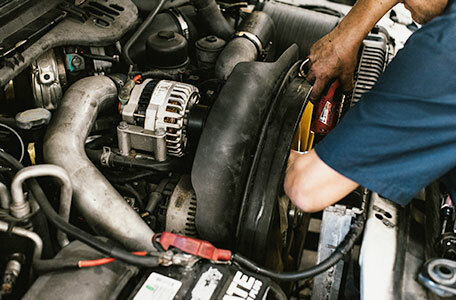 Whether you need a starter or alternator replaced, we have the knowledge to get you back on the road. Give us a call today and we can help you out! Contact a service advisor at Morrison Tire today for Garden Grove electrical repair!